How Can I Tell if I Am Being Scammed by Someone Posing as an Agent of The Nation? We have no relationship with these entities, and we have no guarantee that subscriptions purchased from them will be sent to The Nation. Please be wary of the numerous companies that collect magazine subscriptions and renew them as a third-party agency. Note that we do use some legitimate subscription services to sell our publication. Dial America and North Shore Agency are two of these. 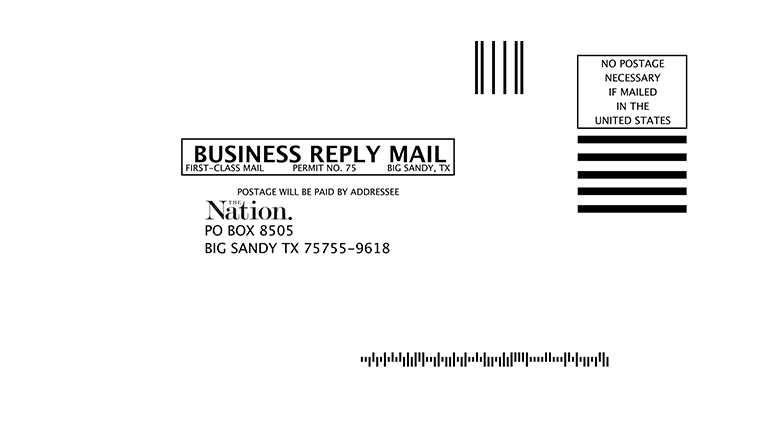 Any mailed renewal notice from The Nation will always display the magazine logo and ask that payments be sent to our customer service center in Big Sandy, TX. If you receive a renewal notice and are unsure of its authenticity, please call our customer service department and order your renewal through us. You may contact customer service by calling our toll-free number, (800) 333-8536. The Nation Builders do conduct monthly telemarketing campaigns. These campaigns are managed by Public Interest Communications, a prominent and reputable telemarketing firm that has offices in Pittsburgh and Salt Lake City. One of those two cities will show up in your caller ID when PIC telephones. Any questions about our telemarketing campaign should be directed to The Nation’s New York City office: (212) 209-5400. WE ENCOURAGE SUBSCRIBERS TO WRITE LETTERS TO YOUR STATE’S ATTORNEY GENERAL. YOU CAN FIND A LIST OF THEIR ADDRESSES BY VISITING NAAG.ORG.